French Custard Glass Jack in the Pulpit Vase. While many collectors know this light yellow opaque glassware as custard glass, it became popular in the United States in the 1890s after being introduced abroad more than a decade prior to that. It was originally made in England by Sowerby and marketed as “Queen’s Ivory Ware,” according to information shared by James Measell in the Antique Trade Antiques & Collectibles. Custard glass, like the French jack in the pulpit vase shown here, was made in other European countries in the late 1800s as well. This interesting glassware is most often of the pressed variety. It varies in color from almost ivory or cream, genuinely bringing to mind the pudding-like dessert called custard, to more vivid yellow with a greenish tinge. 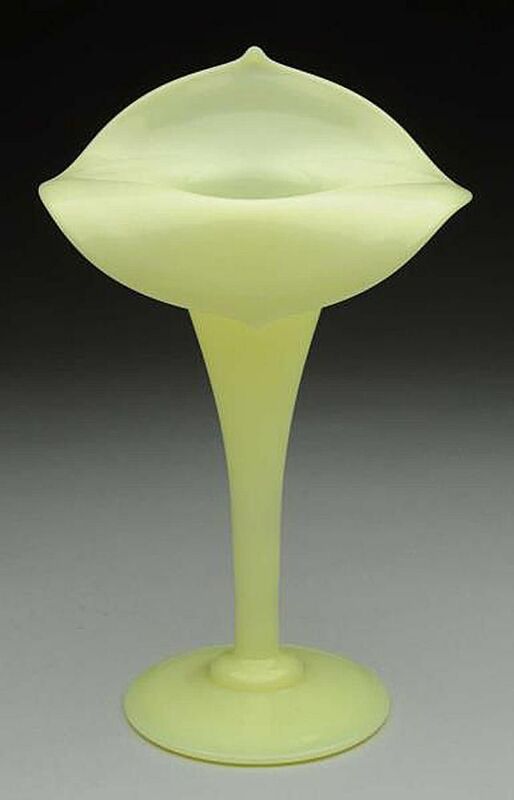 This type of glass got its yellow tint from varying amounts of uranium oxide being added to the molten glass mixture during production, just like transparent uranium glass and green Depression glass. That means most custard glass will also fluoresce under a black light, including newer reproductions (as discussed below). Custard glass also varies in appearance from thick and chunky and completely opaque to more delicate in nature with a bit of translucency about it. Many, many companies competed in the custard glass arena back in the early 1900s. Northwood is said to be the key producer and the first to have made a complete set of tableware in this color. But Heisey Glass Co., Jefferson Glass Co., Tarentum Glass Co., and Fenton Art Glass Co. were all known to have made custard glassware along with a number of other firms. Some pieces were fancily molded, like Libbey’s corn-shaped “Maize” pattern. Northwood and Heisey were also known to market many pieces with painted gold accents. Souvenir glass commemorating travel destinations and historically significant dates or events were also made of custard glass around the turn of the 20th century. By and large, the original custard glass was made through the 1920s, but rarely thereafter as transparent glass became favored by consumers. Yes, custard glass has unfortunately been reproduced. The new pieces look a lot like some of the old ones, so if you’re only interested in adding antique and vintage pieces to your collection, be aware of this pitfall. Also be aware that custard glass made since the 1960s was made with uranium oxide as a component so it does fluoresce under a black light. Unfortunately, you can’t use the fact that it "glows" as the single measure of determining age with this type of glassware although it might help you determine whether or not what you have is indeed custard glass. L.G. Wright Glass Company also used a mark on its pieces that are problematically similar to the old, original Northwood mark. The only difference is a little “tail” on the left side that connects the underscored N to the circle surrounding it. Not all of this glass is marked, so sometimes you have to look for other differences between new and old pieces such as size or shape in comparison to originals. Summit Art Glass also made reproduction custard glass, and some pieces are decorated with gold detailing very similar to that used on old pieces. The most common repro custard glass items are toothpick holders, according to Real or Repro, but bowls, covered jars, shoe whimsies, and patterned tumblers were made among other items. What Gives Glass Its Color?